I am creating projects for the 3 year old class on Wednesday nights this quarter, and I thought I would share what we did. This post includes Jesus Love the Children. This door hanger includes the color and the black & white to print. I decided to use graphics for Jesus with the children back in His time, then on the other side, the hanger shows Jesus with children from now. I had mine cut, glued and the hole cut out before class. Once the students colored it, I had heart stickers for them to add to it. Click here to download it. I also purchased these Children of the World Finger Puppets to use and let the kids take home. These finger puppets are great to have in class to sing Jesus Loves the Little Children & Jesus Loves Me! We have been using them to sing each week. When we taught this lesson, we let them take 2 home! Fun surprise for them. I already purchased more for next year's class! They love them. Something else we did! I found this idea on Pinterest, and there are quite a few places, so I do not know who to give the credit to! Anyway, we wanted something a little different, so I printed one copy of the flower template and cut different colors from construction paper. I printed the leaves directly onto green cardstock. I used an awl to add the center holes. We let the kids pick their colors, layer then and put the lollipop stick through the holes. Just twist to fit over the wrapper. Add the students name to the leaf and glue to the flower. Done! There was one for them and one that had to share with someone. Click here for the templates. 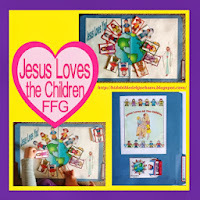 You can find more preschool ideas and printables at Jesus Loves You! The kids love this file folder game! Click here to see it. Love those flowers! What fun Valentines they would make! Thanks for sharing at the Thoughtful Spot! How cute those finger puppets are! This would be something great to do with my 2 (almost 3) year old. Kids love finger puppets. I love the door hanger, such a cute idea for Sunday School!